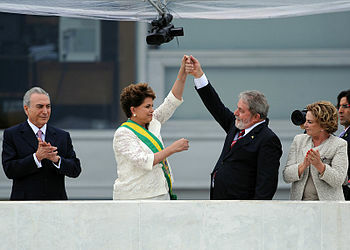 English: Vice President of Brazil Michel Temer, President Dilma Rousseff, former President Luiz Inácio Lula da Silva and Marisa Letícia Lula da Silva at Rousseff’s inaugural ceremony. On Tuesday a Brazilian judge sentenced Marcelo Odebrecht, the former CEO of the Odebrecht conglomerate who is known popularly as the “Prince of Contractors,” to 19 years in prison after being convicted of bribery, money laundering, influence peddling, and associating with criminal elements in Brazil. Now reaching the highest levels of business and politics in Latin America’s largest sovereign state, an investigation known as “Operation Car Wash” is isolating Brazil’s President Dilma Rousseff, whose claims of innocence are ringing increasingly hollow. Rousseff (pictured with Lula) served as chairman of the board of the state-owned oil company, Petrobras, during the time when a bribery scheme involving many of its top executives was in full throat. She also served as former President Lula’s energy minister for five years. There are suggestions that the pressure on the president and her entire administration is building to the point where “sudden regime change” is likely. There is an increasing chance that Odebrecht, jailed last June in a roundup of nearly a dozen other executives of Odebrecht SA, might be able to turn state’s evidence to such a degree that his time behind bars might be cut substantially. One name has led to another, which has led to another, which has led to … some of the closest men to Dilma Rousseff and Lula. [Those arrested] will not want to spend the rest of their lives in jail. They … will sing, sing loud and clear…. If they have anything that implicates Dilma and/or Lula in this mess, it will not only destroy the Workers’ Party … but it will surely lead to an impeachment [of Rousseff]. Odebrecht has done the math. At age 47, he wouldn’t see the light of day until he reaches age 66, so news that he is considering blowing the whistle on some of his compadres in the billion-dollar scandal isn’t surprising. Also considering a plea is Odebrecht’s cellmate, Leo Pinheiro, former head of OAS Empreendimentos SA, one of the largest real estate development firms in South America. Pinheiro was also part of the group of executives rounded up in June. In Brazil plea bargains can often be used to shorten sentences. And Judge Sergio Fernando Moro would certainly appreciate the help. In Brazil judges can and often do work closely with prosecutors in developing cases against criminals such as Odebrecht and Pinheiro. A closer look at Moro reveals a man on a mission: uncover and root out corruption, even if it takes him to the very top of the business and political structure of the country. He helped prosecute corruption at Brazil’s state bank Banestado in 2001, which led to the sentencing of 97 bankers. He weighed in on Operation Farol Da Colina, where more than 100 players in money laundering, tax evasion, and other schemes were sent up. At last count Operation Car Wash has investigated 232 individuals, with 179 of them being indicted and 84 of them being convicted. 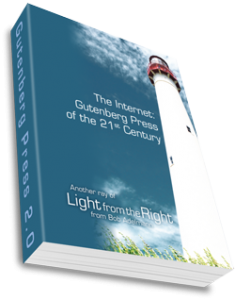 The scandal is spread like a cancerous network across the country and around the world, with at least four criminal enterprises involved in it. Sixteen Brazilian companies are involved, and the investigation is even touching the most highly regarded politician in the land: former President Luiz Inácio Lula da Silva, known as Lula. Last Friday in another roundup, more than 200 police officers and 30 tax auditors raided offices and homes of executives and politicians suspected of ties to the Petrobras scandal, including Lula himself. This was likely the result, some papers reported, of a tip provided by Pinheiro, but that cannot be proven since such tips are kept secret until the investigation is completed. So far the cost of the scandal is in the billions of dollars. It is estimated that the bribes involved in securing contracts to develop the new Petrogras oil fields is approaching $4 billion, while Petrogras itself was forced to take more than $17 billion in write-offs due to the scandal. The companies involved are so huge that their impact on Brazil’s economy is exacerbating the country’s current recession. In the past such criminal activities in Brazil were ignored, overlooked, or forgiven. But the sentence of 19 years given to the head of one of Brazil’s largest conglomerates (180,000 employees, with revenues of more than $30 billion) is a signal that those days are past. On the same day that Judge Moro sentenced Marcelo Odebrecht to 19 years in jail, he added more years onto the sentences of those executives already serving time. In order to cure a disease, its extent must first be determined before a remedy can be applied. If money laundering, bribery, tax evasion, and other criminal activities are the disease, then, for the moment at least, Judge Moro appears to be part of the cure. This entry was posted	on Thursday, March 10th, 2016 at 6:30 am	and is filed under Crime, Politics. You can follow any responses to this entry through the RSS 2.0 feed. You can leave a response, or trackback from your own site.